One of the interesting ways that I have come to look at things is by using the concept of the “Cost of Use.” Today I want to apply this concept to answer the ever controversial question of buying vs. Renting. As you have probably witnessed firsthand, like just about every topic in personal finance there is always a polarized stance on these types of topics. On the one hand you have the camp that believes you should buy a house no matter what and on the other side there is the camp that says you should never buy and rent for the rest of your life. It should be pointed that there are an unlimited amount of permutations of assumptions you can use to set up a mathematical model to answer any personal finance question. That is why the answer of “it depends” is so applicable to almost any personal finance question. Let’s be honest, everyone’s circumstances and goals are different. Please keep in mind that this illustrations sole purpose is to give you another tool to help make important financial choices. This example is based on my own personal situation and experience. Assume $10K/year in Home Improvements/Repairs & Maint. The math on the cost of use for a rental is rather easy, since you really don’t have to take into consideration property taxes, home improvement costs, repairs, and income tax benefits. In this example, it is also assumed that costs for things like utilities and landscaping are comparable and paid by the tenant. 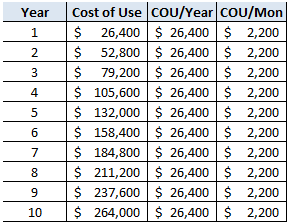 Notes: Cost of Use is Cumulative, COU/Year is an average, COU/Mon is an average. As you have noticed from the schedule above, I have kept the rent flat at $2,200/month with no assumed increases. In the real world I think we can all agree that this is highly unlikely that the rent would stay flat. Here is what it looks like when we assume an average increase of 3% a year (again the average long term rate of inflation). Over the course of 10 years we would incur $38,646 in additional rental expenses related to an annual 3% rent increase ($302,646 – $264,000 = $38,646). Wow! That is a lot of money to be spending on rent. But before we draw any conclusions, let’s compare this to buying a similar home. Thank you Google Street View!!! The math for the purchase of a home does get a bit more involved because of more moving pieces that an owner has to deal with like property taxes, maintenance, home improvements, etc. But that is what all those assumptions were for at the beginning of this post. I would like to point out assumption number 8 above, that states that we currently have no intention to sell the house, therefore we are not factoring in any agent commission (which would run about 5% of the sales price) at the end of our 10 year horizon. We are actually planning to turn it into a rental if it makes sense. Even so, it only adds a couple hundred bucks to the monthly cost of use ($884 jumps to $1,094). 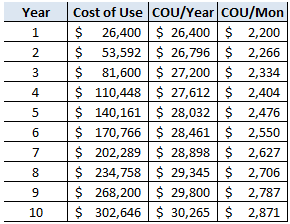 Notes: Cost of Use is Cumulative, COU/Year is an average, COU/Mon is an average. Sales price is equivalent to market value. Now that really puts the $302,646 in to context, doesn’t it? Even after spending $100,000 in improvements/repairs, $115,525 in interest expense, and $77,891 in property taxes renting still cost almost 3X more over a 10 year period. I should point out that the COU in this example is calculated by the following formula [Sales Price – Purchase Price – Improvements – Interest Exp – Property Taxes + Tax Savings]. The idea behind this, is that in the owning scenario, you have actually built up equity in an asset. In the event of a sale, you would capture a lot of the costs that you paid for housing. One thing this doesn’t really compare is the actual cash flow during the 10 year period. As you could imagine the first year of home ownership is going to require substantially more in terms of cash flow when you factor in a down payment and the closing costs of buying a home. In the example below $21,000 is the total for our down payment and closing costs. Overall the cash flow out over the 10 year period for buying a house in our example is $6,348 cheaper than renting a similar house (it’s probably even a bigger gap if you include the increased taxes the renter is likely to pay without the deduction for interest and property taxes, assuming they don’t have the equivalent deductions elsewhere). Besides the first year with the down payment and closing costs, buying a house comes with a lower cash flow out, and that gap in cash flow between buying vs. renting continues to widen over time (assuming a fixed interest rate). I will admit that although cash flow is important it was not something we even considered when buying the house. Because we bought a house that was half as much as the bank said we could afford, cash flow was not really an issue based on our income. But I wanted to point it out because I know cash flow is an important consideration and because this community is so smart, I wanted to get ahead of that question. I think we all knew that from a cash flow perspective that the first 1-3 years was likely going to require a higher cash flow out in the buy scenario then in the rent scenario. But to some it may be surprising that the cash flow over the 10 year period for buying vs. renting is actually less. That is one of the other added benefits of buying a house, you have the opportunity to “Fix” your housing expenses. I put fix in quotations because you still have property taxes that can adjust with the market value of your house and of course, the home improvement costs can be variable as well. Personally, when looking at the buy vs. rent question I prefer to use Cost of Use. Especially if you follow the rule of buying less house then you can afford. When you buy less house than you can afford, cash flow shouldn’t really be an issue (I recommend buying 50% of what the bank says you can afford). If you look at the average COU/month it is about 69% cheaper to buy vs. own ($884 vs. $2,871). Every situation is unique and I urge you to run your own numbers. But in this case I say BUY, BUY, BUY, UNTIL YOU’RE BLUE IN THE FACE!!! If you are a numbers and spreadsheet junkie like me than you would immediately realize how fun it would be to set up this same Cost of Use analysis up for other big purchases in your life. Like a car perhaps? Or what about a hot tub (I mention it since we recently bought one)? What say you intelligent readers? Do you like the concept of Cost of Use? How do you decide whether it is better to buy vs. rent? p.s. In the example I used a comparable house in the neighborhood from which we purchased our home. I also took the low end of the rental market to be conservative in this analysis. However, in reality, when were actually making this decision we were living in a different market all together paying $3,100/month in rent. It made this move and purchase a no brainer. But I wanted to use a real example to convey the concept of Cost of Use. GYFG, thank you for the great analysis. My wife and I developed a nearly identical analysis when looking for our first house. The one thing I would add into your housing use is homeowners insurance. That could very well be part of your maintenance costs, but I’m unaware of a lender who would not require insurance on a mortgage. For us, it came down to more intangible things (although our MITI is still less than our previous rent) such as a backyard to call our own and not having to deal with shared walls, also we could get a puppy 😉 the triple tax benefit doesn’t hurt either. Love these analysis posts, keep an coming! Hey Sorro – I should had specified that in the cash flow part of the analysis I did include the cost of home owners insurance and an HOA. I also assumed that the $10K/year in the COU analysis would cover this as well. Probably should had called that out better. Thanks for calling it out for others to take note of. That’s why I love being able to continue the conversation in the comments. There are definitely non-monetary reasons for buying a house vs. renting as well. I’m glad you finally put some more definitive numbers to this age old question. It does totally depends on your situation! Your assumptions do a great job of highlighting the most important variables as to whether or not a home purchase is a good idea or not. I believe the most important are purchase price, interest rate, appreciation potential, and your income bracket. Hey Michael – I have seen so many posts out there that say to never buy and rent forever. Or on the other end of the spectrum to buy as soon as possible so you can stop throwing money down the drain. But what all of them failed to deliver was some real numbers as to why one is a better choice than the other. And to your point, there really isn’t a cookie cutter situation. When we lived in Newport Beach, it made way more sense for us to rent then to buy. Thanks, this is a very helpful way of looking at things. I’m considering purchasing a home now and this definitely puts it in perspective. One other consideration for an apples to apples comparison would be to include the investment income you could gain from holding on to the $21k down payment in the rental scenario. I wonder if this would tip the scale? Also, regarding the comment above on mortgage insurance, I discovered you can avoid mortgage insurance through Sofi even when you have as little as 10% down payment (although they probably build it into the interest rate). You could include the opportunity cost of not investing. Let’s say you were able to compound the $21K at 7% for 10 years, your investment would turn into $41K, for a gain of $20K. However, I also didn’t penalize the renter for additional taxes they are likely to pay. If you take my example for instance, I was already maxing out my tax deferred accounts, so buying a house was a great option for me to avoid an additional $58K in taxes. Do the math for your own situation. But in mine it still made sense to buy the house. This is a great breakdown Dominic. Well done. As someone that has already purchased a home, I prefer posts that decide it is better to do so! *a pat on the back* I do think there is some weight to the argument that houses tie us down. As I’ve spend every night this week on my knees in our home’s crawlspace putting up insulation, I’ve decided there are definite perks to renting. But because we like to do our own stuff, I still prefer to have my own house. Sounds like you are working hard around your house. If you ever have some extra time you don’t know what to do with, my wife has a list a mile long of projects she wants done around the house. They get done slower than she would like sometimes, because we typically hire them out. Glad you are happy with your decision to buy. But your purchase price of the house is also very low for a SFH so I am confused if this is a real example. Wow, the inland empire is cheap! We rent a one-bedroom in Laguna Beach and can’t make the numbers work to buy a place. Would love to find a duplex here though, but I’d need over 200k in cash for a down payment. 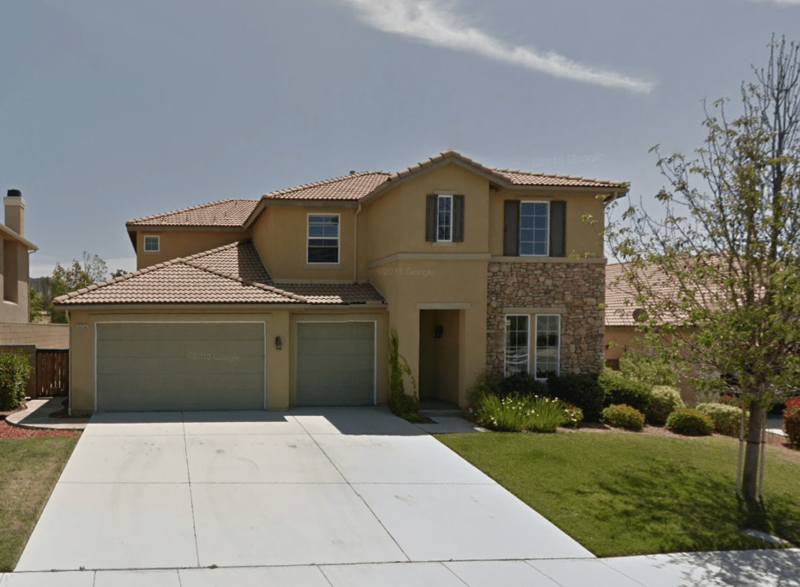 Hey Conrad – Yes, the inland empire is much cheaper than the OC. It is one of the reasons we decided to move from Newport Beach. It’s hard to make the numbers work in the OC. Great breakdown and number crunching. It’d be interesting to run the numbers through to compare real estate pricing and rental price in Vancouver. Rental probably makes more sense in Vancouver. Tawcan – I have heard that house prices in Vancouver are crazy high. Any chance you might run the numbers? Thoughtful and depressing analysis. Like you alluded to in the comments above, it certainly depends on the market. Renting certainly makes more sense for my market, and gives the added benefits of flexibility and the opportunity to live in places I couldn’t necessarily afford the mortgage on (or want to afford). I pay about the rent you were paying before, but would be unable to find a house or apartment even close to that purchase price around here (or even double that). Is a solid decision on your part though. I guess I agree with both of our strategies. The numbers help keep us all honest my friend. When we lived in the OC we could never comfortably buy what we wanted to live in. If we were still living there, we would likely still be renting. As other commenters have already mentioned, this is a terrific analysis. But at the end of the day, few people buy a home because it makes financial sense to do so. They buy a house because they want to appear like they are evolving in life. And sometimes they pay a financial price for that decision. It get worse though. I read an interesting post on Mr. Money Mustache I think where he did a thorough financial review of living in the suburbs versus buying a condo in a major metropolitan downtown area, which in most cases was considerably more affordable. Yet most people choose to bear the financial costs and live in the suburbs anyway. Because again, we want to be like those around us. As other commenters have pointed out, we don’t want to share walls, we want our kids to attend good schools and we want a fenced in backyard where our pets can roam free. Still, as finance bloggers, it’s up to us to point out the costs of those decisions. Well done. Very valid points Laura Beth! Not all financial decisions are rational. I think the important thing is to follow the 80/20 rule. At the end of the day I just want people to understand the math and even if they make the decision that isn’t always the most optimized financial one, at least they completely understand what they are signing up for.